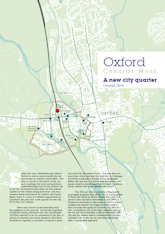 Earlier this year a workshop was held in Oxford to look at the zone around the station known as Oxford Central West (read report). This area is crucial to the future of the city and is perhaps the most extraordinary underdeveloped area of any historic city in the UK. With plans for the redevelopment of the station being promoted and masterplans being announced for Oxpens and Osney Mead, there is a once in a lifetime opportunity to transform the area into a new quarter for the city fit for the 21st century. There was concern at the workshop that the potential of the area will not be fully exploited unless the various developments are coordinated. Yet there seemed to be no mechanism to do this. A group of urbanists and urban designers therefore resolved to explore a physical vision for the whole of area. This was not intended to challenge any of the proposals currently being developed. Rather the aim was to explore how the various proposals could be joined together to create a coherent urban quarter and better gateway to Oxford. The 200 acre site is currently a fragmented and largely forgotten part of the city. It is susceptible to flood and sliced up by the railway line, river and canal so that east/west movement is very difficult. Despite its proximity to the centre of Oxford it feels isolated and despite the character of the canal it does not have the appeal of a valued area like Jericho. It should be one of the most valuable parts of the city but the constraints make development difficult and the railway station redevelopment remains unfunded. All of this can potentially be overcome with a coordinated approach. This report sets out a vision for how this could be achieved. We have produced a brief illustrated summary of the event’s conclusions and a pdf file in the form of a slide presentation which gives a much fuller account of the day’s proceedings. Both can be freely downloaded from the links. The existing station site is too cramped to accommodate the increases in travellers that are predicted for the existing and planned services (e.g. East-West Rail). None of the recently proposed designs for a new station were an improvement on the existing one in terms both of connectivity with other modes of transport, including cycles, and space for travellers within the station. The extra two tracks across the Botley Road, combined with the proposed provision of standard vehicle clearance beneath the bridge will be very expensive and also require the west end of Frideswide Square to be re-designed (again). A cheaper and more effective solution would be to build a new station/ transport hub at the Oxpens (as suggested by Arup for the County Council in 2002/2004), avoiding the huge disruption to rail and road traffic if the existing site is used, and using the new bridge to Osney Mead as a cycle/pedestrian/tall vehicle/rapid transit route, linking through the retail areas to the south of the Botley Road, not the narrow and congested junction with Ferry Hinksey Road. This would also open much wider opportunities for wider coordinated and world-class development at the site, with higher value potential. As well as Amersfoort station, stations at Breda and Arnhem give some idea of the positive impact such developments can make.